The Huskies visited President Obama and the White House for the 2nd year in a row to celebrate their 2nd straight undefeated season this afternoon. 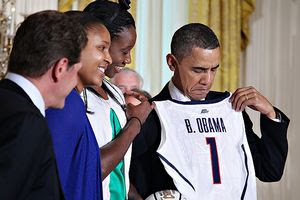 President Obama gushed about how much he thinks of the Huskies saying, "I was telling them Michelle and I work out in the morning -- see, we got a little gym here in the White House -- and we just watch 'SportsCenter,' I know you'll be surprised that we don't watch the news shows. But -- this is really true. You know, during the entire season, I just kept on repeating -- and I truly believe -- this was the best team in all of sports, any sport, any gender, by far."